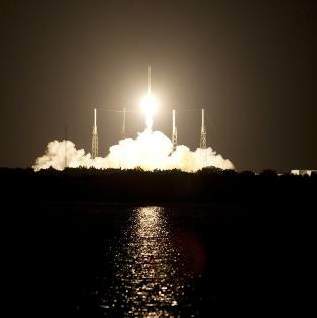 An unmanned, privately owned Falcon 9 rocket with a reusable cargo capsule blasted off from Cape Canaveral Sunday on a mission to restore a U.S. supply line to the International Space Station in the wake of the space shuttle’s retirement. Powered by nine oxygen and kerosene-burning engines, the rocket, built by Space Exploration Technologies (SpaceX), lifted off from Cape Canaveral Air Force Station on its way to docking with the station on Wednesday. A mid-space delivery using the onboard Dragon capsule is the first of NASA’s Commercial Resupply Services (CRS-1) mission to the International Space Station. The SpaceX CRS-1 is an important step toward making America’s microgravity research program self-sufficient by providing a way to deliver and return significant amounts of cargo, including food and science experiments, to and from the orbiting laboratory. NASA has contracted for 12 commercial resupply flights from SpaceX. The Dragon supply capsule will return to Earth for reuse, splashing down in the ocean later this month.